The biggest difference between family and friends is that we get to choose our friends! And the best friends are the ones who support and encourage us as we strive to meet our goals. I love this image from Sasayaki Glitter which gives a whole different slant to the word "support!" I used ProMarkers to color the image, then fussy cut it with a craft knife. I haven't cut with a craft knife in so long that I'd almost forgotten how to do it but I persisted and it turned out fine. I dug through my scrap stash, found the fancy die cut oval (Spellbinders), and decided that it made a perfect background for the kittens. I mounted them onto dimensional dots and then added it to the oval. I put that piece onto confetti CS, added the printed sentiment, and called it finished! Another of my CAS cards good for a guy or a gal. Fabulous fussy cutting and especially with a craft knife! I've never been able to get the hang of that. 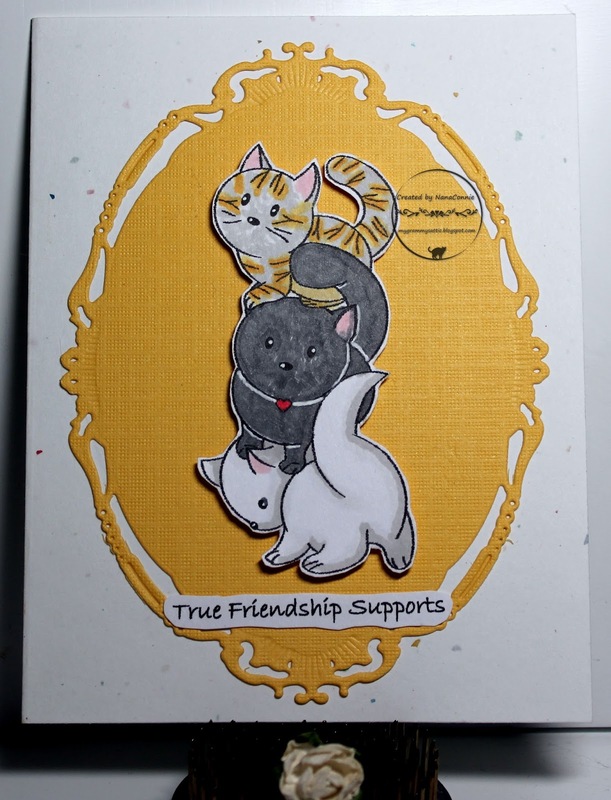 CUTE card and love the little stack of cats. The little stack of kittens are adorable! I can't believe you were able to cut around them with a craft knife! Wow! Thanks for sharing it with us at Lil Patch of Crafty Friends! I love this cute image and great fussy cutting too. Love the sentiment and the die cut compliments these little cuties. I hope that you have recovered from your bout of illness. Love the diecut, it's perfect for those kitties. So Sweet and Wonderful creation and a wonderful design!!! Love your cats!! Cats is a wonderful animal!!! So Sweet and Wonderful creation and a wonderful design!!! Love the colours! !